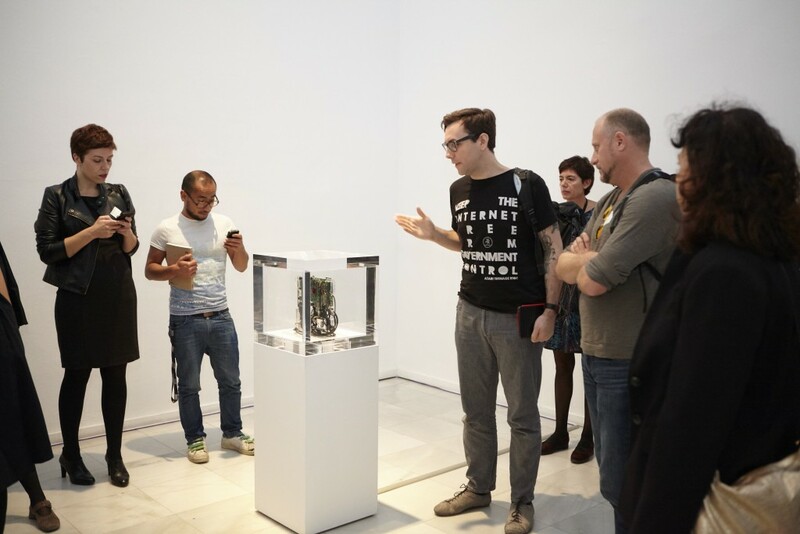 Pursuing the possibility of emancipatory use of technology, Paglen, together with Jacob Appelbaum, developed Autonomy Cube (2014). Autonomy Cube is a sculpture and internet router designed to be housed in civic spaces. The sculpture is meant to be both “seen” and “used.” Formally it references Hans Haacke's 'Condensation Cube' (1963-65). Inside the cube, however, the wireless router offers free, open-access, encrypted, Internet hotspot which enables private, un-surveyed communication. Anyone can join this network and use it to browse the Internet, undetected. Autonomy Cube does not provide a normal internet connection. The sculpture routes all Wi-Fi traffic over the Tor network, a global network of thousands of volunteer-run servers, relays, and services designed to help anonymize data. Autonomy Cube is itself a Tor relay, and can be used by others around the world to anonymize their internet use. Providing a tool for surveillance-free internet infrastructure in which data and internet use can be anonymous. Reclaim the space within which users log on through the autonomy cube as public, civic space. Allow the host institution and users to log on to the internet without being traced or surveyed.